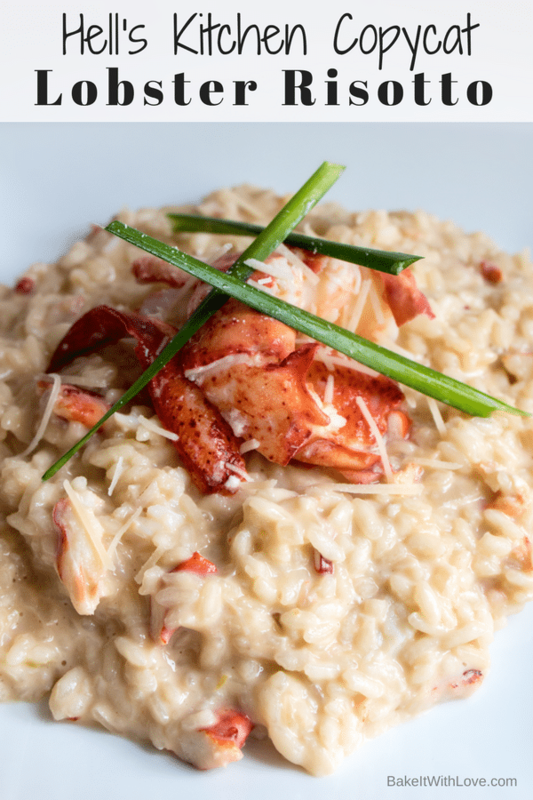 Our Lobster Risotto, a very close version to the one seen on the hit TV show Hell’s Kitchen! We tend to binge watch Gordon Ramsay shows and since Hell’s Kitchen frequently features Lobster Risotto, we have always loved the look (and tantalizing taste!) of Gordon Ramsay Hell’s Kitchen Lobster Risotto Recipe. So, we thought we’d try to find and match the particulars of the HK hit dish. As with all recipes, we tweak things here and there to our cooking style and liking (and working around what kids will eat) but the recipe shared below is indeed very close to the recipe used for the Lobster Risotto seen on the show. Our modifications and/or personal preferences will be noted in parentheses or in the recipe notes section. 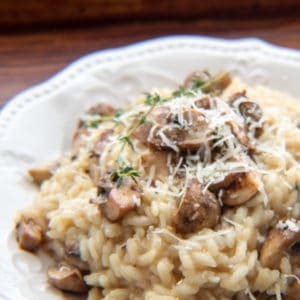 If you love this risotto recipe, try out our recently added Gordon Ramsay’s Mushroom Risotto and Gordon Ramsay Fresh Pea & Mint Risotto Copycat! One of the most important aspects, in our thinking, to a fabulous Lobster Risotto is using the lobster shells for the stock. Taking the extra time to make your own stock for this risotto dish is so rewarding! Begin with bringing 4 cups of water to a rolling boil, then add the lobster (thank you Clam Man for our recent batch of fresh, live lobster!) and boil for an additional 4 minutes. Remove the cooked lobster and plunge it into ice water to stop the cooking process. Remove the lobster meat, dice the meat, and refrigerate it until ready to add to the risotto. Return the lobster shells to the boiling water used for cooking the lobster. Add the vegetables to the boiling water and lobster shells: onion, carrot, celery, tomato, plus the bay leaf, and then salt and pepper. Reduce heat, and simmer the broth for 20 minutes, then strain out the lobster shells, vegetables, and bay leaf. Return the broth to your saucepan and keep on medium heat to add to the risotto. Bring a large skillet or frying pan to medium heat, add olive oil, minced shallots, and minced garlic and cook for 1-2 minutes until the shallots and garlic are slightly softened. Add the Arborio rice and cook for an additional 1-2 minutes, stirring occasionally, then add the white wine. Stir for about a minute, while cooking the wine, then add about one-third to half of the lobster stock to the skillet or frying pan of rice. *The lobster stock links contained in this text will take you to our ‘How To Make Lobster Stock‘ page, which includes video. The quick lobster stock instructions are on this page. Stir the rice occasionally, and cook for 3-5 minutes, or until most of the lobster stock has been absorbed. 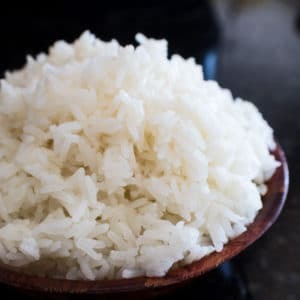 Add the remaining lobster stock in portions (we use a ladle portion each time) until your Arborio rice is slightly translucent and still al dente (firm to the bite) in texture. It takes about 20 minutes once you start adding the lobster stock, and you should still be able to see a bit of the white core of the Arborio rice when you have achieved a nice al dente texture to risotto. Once the risotto has reached the right texture, add the diced lobster meat, butter, mascarpone cheese (or cream cheese), lemon zest and salt & pepper (to taste). Stir the ingredients together vigorously to incorporate them throughout the risotto, until you have a nice creamy lobster risotto. Serve immediately, garnish with optional Parmigiano and chives (or parsley). Enjoy! As seen on Gordon Ramsay's hit TV show, Hell's Kitchen. 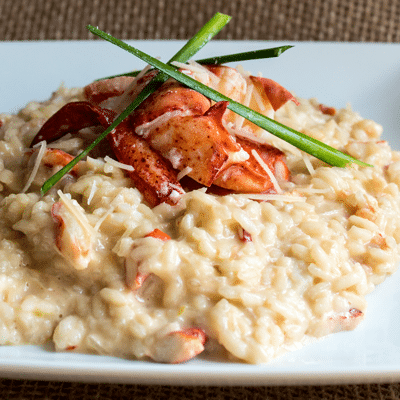 This Lobster Risotto is so creamy and delicious! Bring 4 cups of water to a boil, add lobster and continue to boil for 4 minutes. Remove lobster and plunge into ice water. Remove the lobster meat and dice for the risotto, then refrigerate. Return the shells to the boiling water. Add onion, carrot, celery, tomato, bay leaf then add salt & pepper to taste. Simmer the broth for 20 minutes then strain out the lobster shells, vegetables and spices. Reserve broth and keep on medium heat for use in the risotto. Bring a large skillet or frying pan to medium heat, add olive oil, shallots and garlic. Cook until softened (1-2 minutes). Add the Arborio rice, cook (stirring occasionally) for 1-2 minutes before adding dry white wine. Add wine and cook for a minute, keeping the rice moving (stirring frequently). Add one-third to half of the lobster stock, cook (stirring occasionally) for 3-5 minutes until the rice has absorbed most of the liquid. Add the remaining lobster stock in ladled increments, allowing the rice to slowly absorb the liquid until the Arborio rice becomes slightly translucent and is an al dente firmness and the core can still be seen in the center (about 20 minutes total time once broth is added). Add the reserved diced lobster meat, butter, mascarpone cheese, lemon zest and salt & pepper (to taste). Stir vigorously until all ingredients are well combined and a thick, creamy risotto is achieved. Correct the seasoning (if necessary), serve and garnish with parmigiano and chives (if desired). *In addition to our recipe modifications listed above in the ingredients and instructions, we added Parmesan cheese when we added the lobster and cream cheese (in addition to garnishing with the Parmesan cheese) to achieve the lobster risotto pictured with this recipe. Was looking for something fancy last night, so I made this. It was INCREDIBLE. I ended up running out of stock (and the rice was still crunchy) and having to add about another cup or so of water so it would cook all the way through. This was super decadent and delicious. Definitely a little too expensive for an every day meal, but for a special occasion it was a winner! The lemon gave it a nice subtle touch. 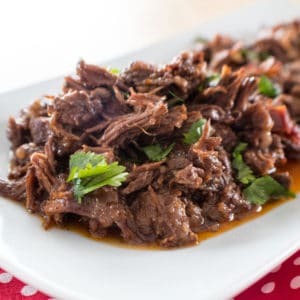 A little time-consuming, but overall a great recipe and not incredibly difficult. Absolutely fantastic dish, so glad to hear that you enjoyed it (and that it was a Valentine’s meal)! This is a great recipe. Thanks! I used the marscapone and Parmesan, but I forgot to add the butter (I don’t think this rich dish missed it at all). I finished it on the plate with a lemon garlic dill salt I made. Heavenly! We absolutely love this recipe, so glad you enjoyed it! Hey, I added “Better then Boullion lobster base” when I added the vegetables. Instead of the whole lobster, I used tails. It came out wonderful. Thanks for the recipe! Thank you for sharing your modifications Erin! We love this Lobster Risotto, glad you like it too!